Sullia, June 7, 2016: In a tragic incident occurred when the manager of Lord Mahalingeshwara Temple was killed after a Bull forcefully pierced his body with his horns on June 6th at Ajapila Bellare. Deceased has been identified as Narayan (40), resident of Kalanjeri, Pailar died in this tragedy. It is said that Bull was living in vicinity of the temple. 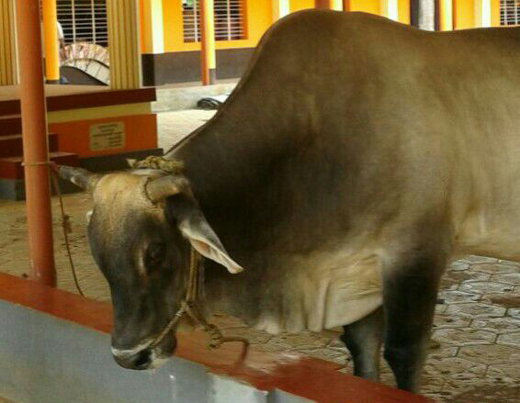 On Monday Narayan had approached the bull to bring it near the temple for the Puja. All of a sudden Bull forcefully inserted its horn in to his body resulted death on spot. Body was shifted to government hospital. Narayan was residing in Bellare and was working as manager from past 15 years.